View More In Selfie Sticks & Tripods - Page 7. The Manfrotto Shoulderpod X1 Professional Rig is an advanced production rig ideal for mobile journalists and filmmakers. Add professional microphones, lights or extra batteries to your mobile camera and use it handheld or mounted on a tripod. 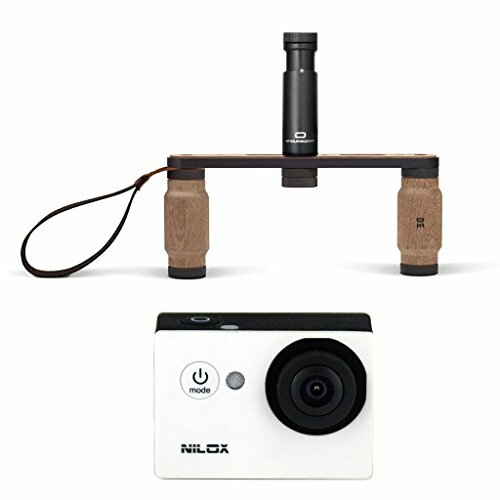 This modular system allows you to craft your own solution for mobile photography and switch it up when you need to -- take only what you need when traveling. Everything has a solid construction for durability and reliability. With the Shoulderpod X1, add an accessory such as a microphone, light, action camera or extra battery to your mobile device. Build your own setup with the included P1 long plate, K1 knobs, Z1 cold shoe, H1 handles and W1 wrist strap in seconds, and hold your setup comfortably and securely. The X1 was engineered and crafted in Barcelona out of DIN- 6082-T6 aluminium, high grade polymers and natural sapeli wood. All parts are beautiful and reliable. This rig is portable and of the highest quality, making it ideal for professionals.